What a terrific second quarter by the Spartans. But I don't think the Ducks will roll over, though. This has the makings of a classic. Connor Cook is starting to roll. - It's simpler said than done, but the Spartans needed to avoid allowing turnovers and big plays today. So far, they have not. A turnover and two big plays turned the course of this game against MSU. But they hung in there very well vs. the Ducks. A turning point was the Spartans' defense imposing their will at the end of the second quarter, which led to their second TD. Also, the Spartans have avoided penalties, another good thing. 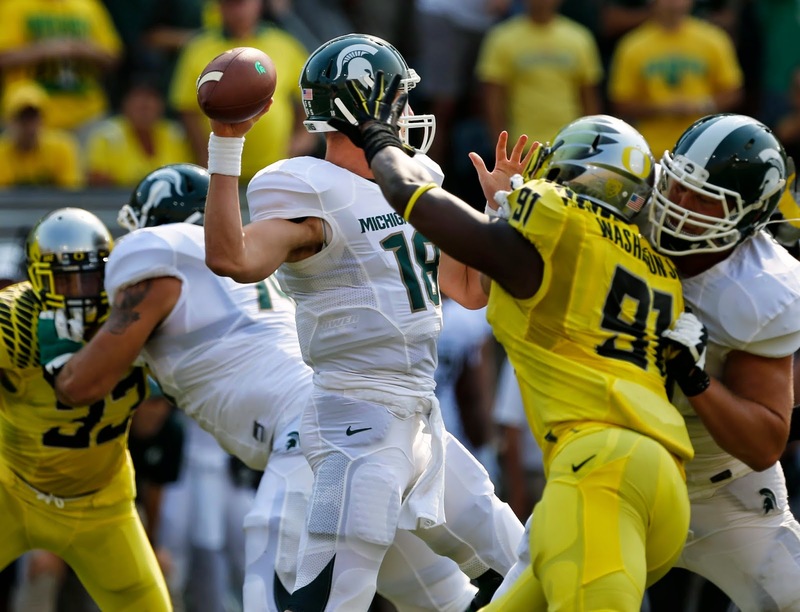 - Spartans' defensive lineman Marcus Rush is one of the most underrated players in the nation. He often plays at the level of All-American. He is so far today. - An underrated aspect of Mark Dantonio's coaching has been in-game adjustments. His staff already made a big one with the Spartans switching to a hurry up offense. It was a big factor in the Spartans improvement offensively during the second quarter.